Blood clots form from platelet activation. Platelet activation occurs from a breach in a blood vessel wall that exposes collagen and platelet tissue factor. Platelet tissue factor is a protein that enables cells to initiate blood coagulation cascades, similar to a car pileup, which makes the formation of clots possible. A blood clot is the final product of the blood coagulation step in homeostasis. Homeostasis is a process which causes bleeding to stop, that is to say that it keeps blood within a damaged blood vessel.Â A blood clot is also known as a thrombus, and has two components, the first of which is the aggregation of platelets that form a platelet plug and a mesh of cross linked fibrin protein. A blood clot is a healthy response to injury intended to prevent bleeding. Bleeding in this context refers to blood escaping from the circulatory system, or hemorrhaging. In fact homeostasis is the first stage of wound healing whereby blood goes from a liquid to a gel, otherwise known as coagulation. On a dailyÂ basis, blood clots form as a result of impact or injury and dissolve in the blood stream without medical intervention. 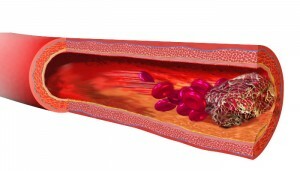 However, blood clots can be harmful in thrombosis, when clots obstruct blood flow through healthy vessels. A thrombus can decrease blood flow through a vessel, known as a mural thrombus, or block blood flow completely. A thrombus that completely obstructs the flow of blood through a vessel is known as an occlusive thrombus, and can result in the death of tissue supplied by the obstructed vessel. Tissue death in this context is known as an infarct. If a thrombus dislodges from the blood vessel and becomes free-floating it is referred to an embolusÂ . Visiting your doctor and treating this disease with blood thinners (anticoagulants) is essential to a successful recovery.